We liked your space and what you've already done with it! We thought that it needs to be brightened up a bit - there's a lot of brown and tan going on. So I used a lot of white with some mint accents which is really hot right now. Hopefully you like it! Oh and I threw in some bronzy-toned items to tie in the bar cart you like as well as the warm tones of the walls. There's also a couple of silver accessories to mix it up and balance with the other silver accents you already own. I think all of the metallics will look great together. 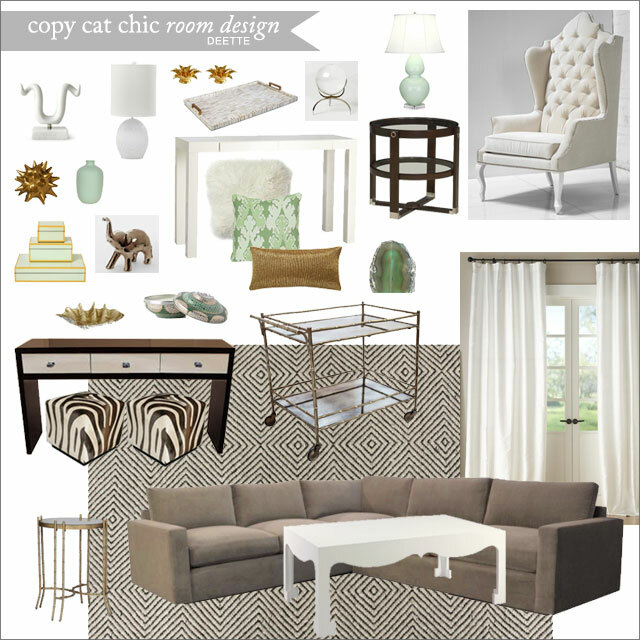 The pieces that I recommend replacing: the rug, pillows (except for the cream/white fur one), and the Eileen table. I like the CB2 table on that side of the couch and I've found another end table that ties in with the media console you have. For the window treatments I think you should leave the arched window as is. Also I think maybe keep the two long thin windows on either side of the fireplace bare too. I chose light colored drapes for the regular sized windows on the wall opposite the fireplace.